After completing an online order, many users are interested in following their order as it progresses through the various stages of order processing and shipment. 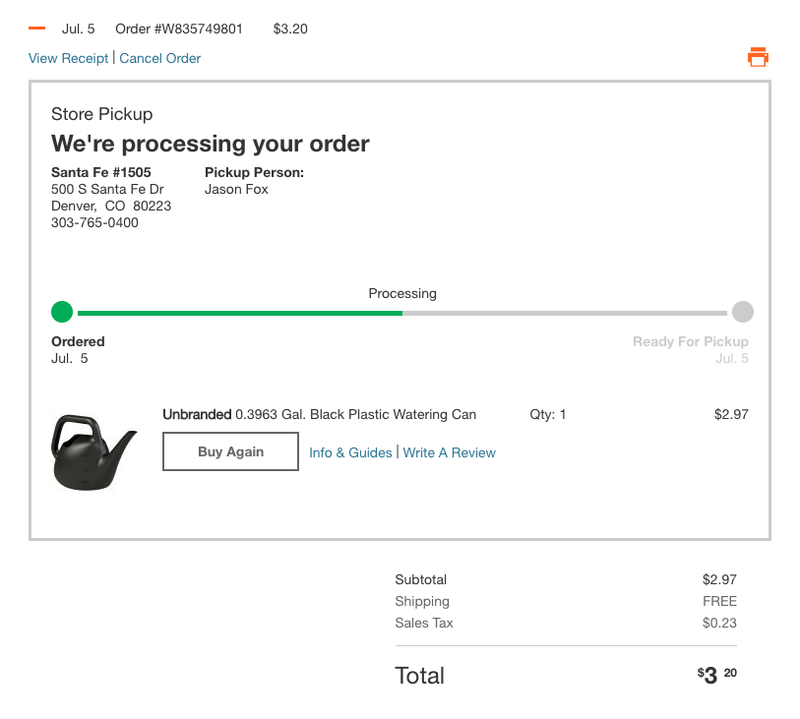 Our large-scale Accounts & Self-Service usability testing revealed that users track their order at many different times — ranging from immediately after completing the checkout (e.g., to see if it’s processing) to several days after submitting the order (e.g., to check on the status and learn when to expect it). However, when the order tracking information was provided via third-party tracking or shipping sites — rather than being integrated within the e-commerce site itself — users during testing found it harder to access, understand, and navigate the order-tracking details. Indeed, by not providing tracking information on the site itself, sites are giving up control over the end user experience — which our testing revealed is often poor on third-party tracking sites. Yet our UX benchmarking reveals that 56% of e-commerce sites fail to integrate all tracking information and events within the site itself — relying instead on a third-party tracking site to provide the information users need at what can often be an anxious and critical time in the e-commerce shopping experience. Baymard’s quantitative study of 1,102 users, identifying what Self-Service Account features users generally consider the most important. Tracking orders was by far the most sought-after feature. Baymard’s quantitative study shows that the single most important self-service feature for users is tracking of open orders, primarily order status and arrival date. Despite the importance to users, many sites outsource all or parts of the order and shipment tracking to third-party sites, like the shipping courier. It may be easier and cheaper for e-commerce sites to outsource the entire order-tracking page or large parts of the tracking functionality to third-party courier sites rather than developing and maintaining this information directly on the e-commerce site. Our testing showed, however, that relying on third-party sites can pose a variety of difficulties for users, and was consistently observed to offer a subpar user experience, compared to displaying the full order progress and shipping events directly on the e-commerce order status page. Users are unlikely to go to a third-party site unless they have good reason to. In testing, users visited courier sites mainly when the e-commerce site forced them to by not offering any other parcel-tracking interface, or when e-commerce sites had incomplete information (e.g., missing elements such as the delivery date, shipment subevents, or the name of the courier company). These basic details are fundamental to users who are trying to track their order. Visiting a courier site to track, typically, only the parcel for the order is an extra step that can add significant complexity to the overall user experience of placing and tracking an order. In particular, the transition from the e-commerce site to third-party sites, and the fact that the courier sites only contain package info and not the full order info and features, was in testing observed to cause significant usability issues. 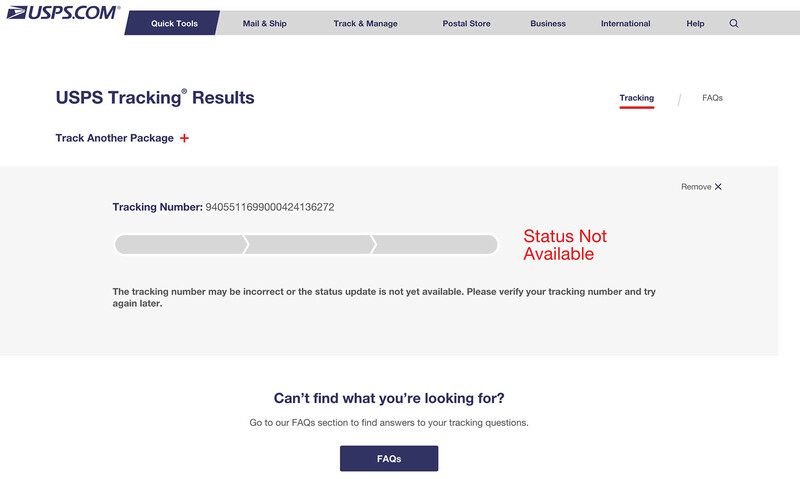 1) Missing information: One particular downside of mainly providing users with tracking via third-party courier sites is that, until the package has shipped (which will typically be within the first 1–48 hours after the user has placed their order), any attempt to track the order will often just result in a message like “Status Not Available”. A message like this doesn’t help users with an expected arrival date, and can furthermore induce anxieties about whether there’s an issue with the order — not an ideal and reassuring experience right after having provided payment for an order. 1) Missing information. Once the package is being processed by the e-commerce site — and, in particular, in the interim period from when it is packaged but not yet handed over to the courier — there is often a delay before the tracking page is available at the courier’s tracking page. If users click any third-party tracking link during this interim period, users will often see a message like “No package information available” or “Status not available” — often for several hours or even a full day. Such a message is not helpful in answering a user’s predominant question: “When will the package arrive?”, and is sometimes even seen to cause anxiety as many users misread it as an error message or as indicating an issue or delay with the order. This confusion in turn leads to some of these users frantically returning to the tracking page several times only to see this same “Unavailable” status page, and some even reaching out to customer support. Regardless of the level of anxiety, it’s not a good initial experience after having just placed an order. Furthermore, if the e-commerce site relies mainly on the third-party courier sites as the only form of order tracking, this means that users will not be able to get insights into the order progress when the order is still at the e-commerce site, and won’t be able to see order updates like “order received, not yet processed”, “order being prepared at warehouse”, “order packaged, ready for shipment”, and “package passed on to courier”. 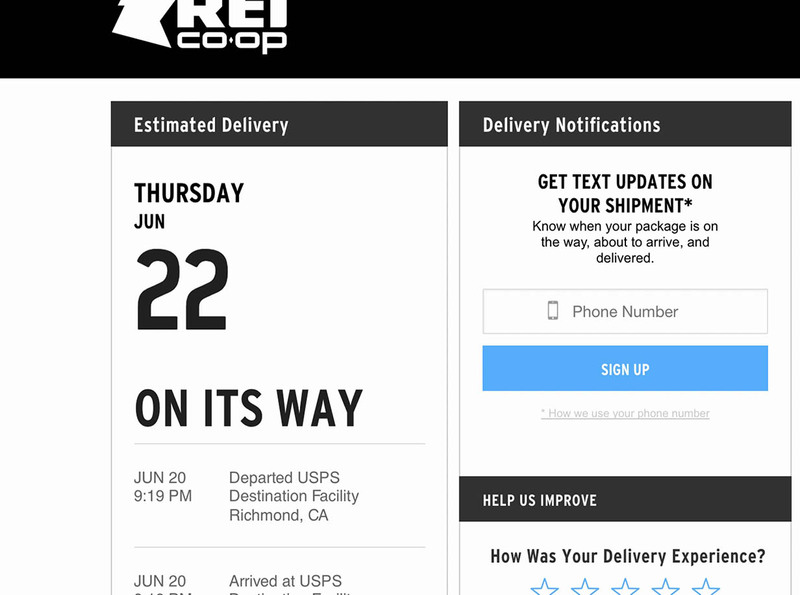 2) Disconnected information: When users during testing clicked a link in the shipping confirmation email from REI (first image), the corresponding purchase details page did not show the delivery date (second image), so every single user then had to click through to a third-party site to find out when the order would arrive (third image). 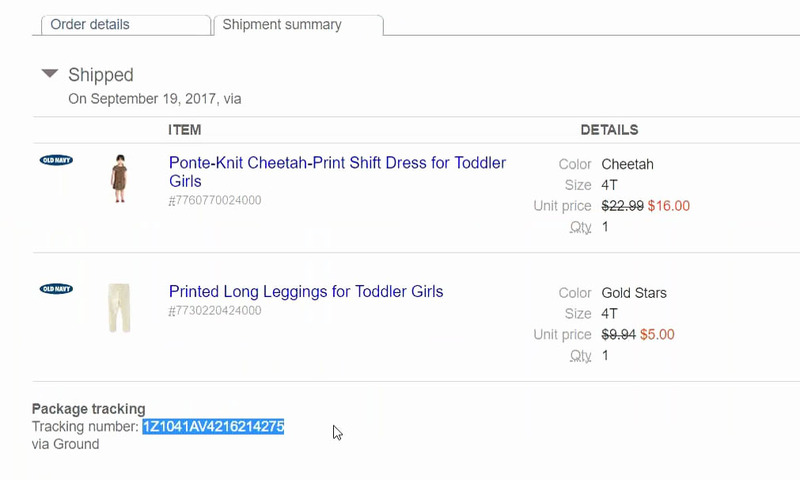 An absent tracking detail forces all users to click away from the e-commerce tracking page to find the information on a third-party site, reducing the effectiveness of the former. Furthermore, on the third-party site there are no order details such as shipping address, order costs, or the order contents — forcing users to go back to the e-commerce site to find those details. 2) Disconnected information. 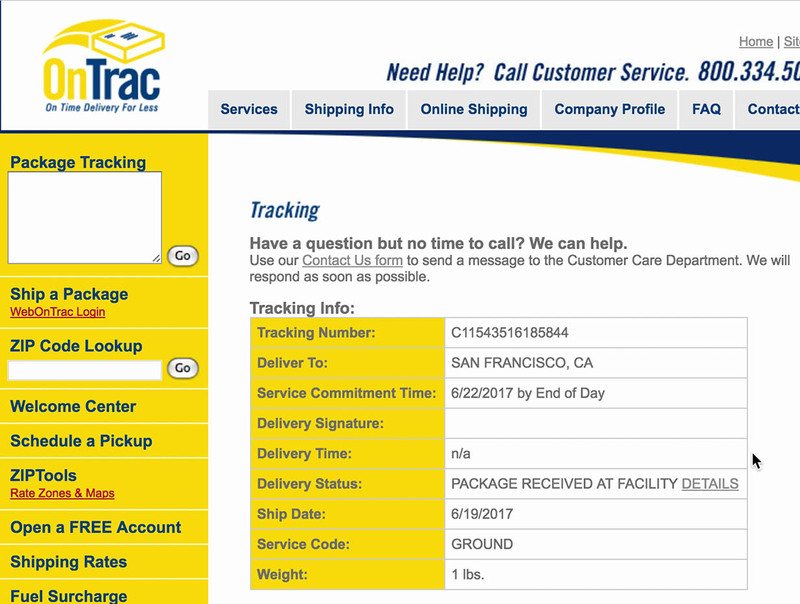 The third-party package-tracking site will often only show the package details, such as arrival date, shipping events, and the package’s current location. 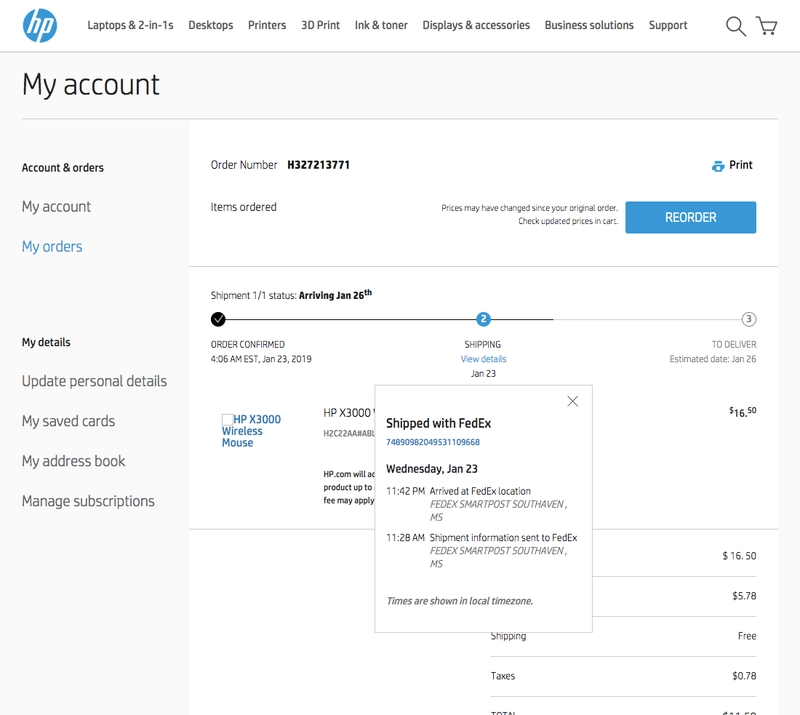 Hence, if users need to see any order details (like the shipping address, order costs, or the contents of the order), need to cancel an order, contact customer service, see the product page for one of the ordered items, etc. they will simply not be able to do so, as these data are not available on the third-party tracking page. All of these users will then need to go back to the e-commerce site’s order details/tracking page. However, because the third-party courier’s webpage will seldom link back to the specific order at the e-commerce site, users will often have to “start from scratch” by typing in the URL of the e-commerce site, signing in, navigating to open orders, and then opening the specific order. For users with multiple orders, the severity of these issues scales linearly as all those steps must be repeated for each order. 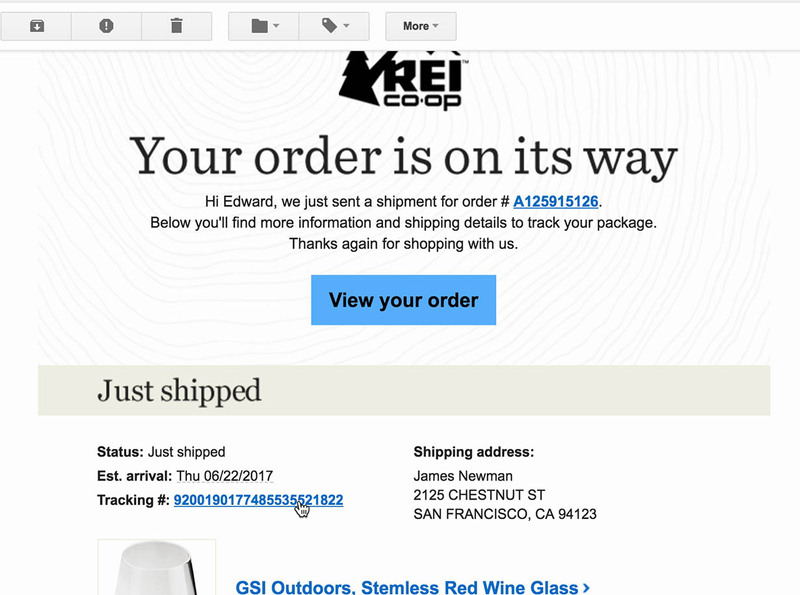 On GAP, the courier name is not stated, there is no indication of what stage the order is in in the shipping process, and there is no link to the third-party site. E-commerce sites that lack basic order information force users to go elsewhere to find it. Furthermore, sometimes in testing we also observe the reverse issue: users on the e-commerce site’s order status page lack information that is only available on the third-party courier site (e.g., the shipping subevent or whether a signature is required). However, this issue is less severe, as the order status page usually links directly to the third-party site. 3) An incoherent user experience “Now what do I do? I guess I gotta start backpedaling. I sorta wish there was something here telling me where to go next”. 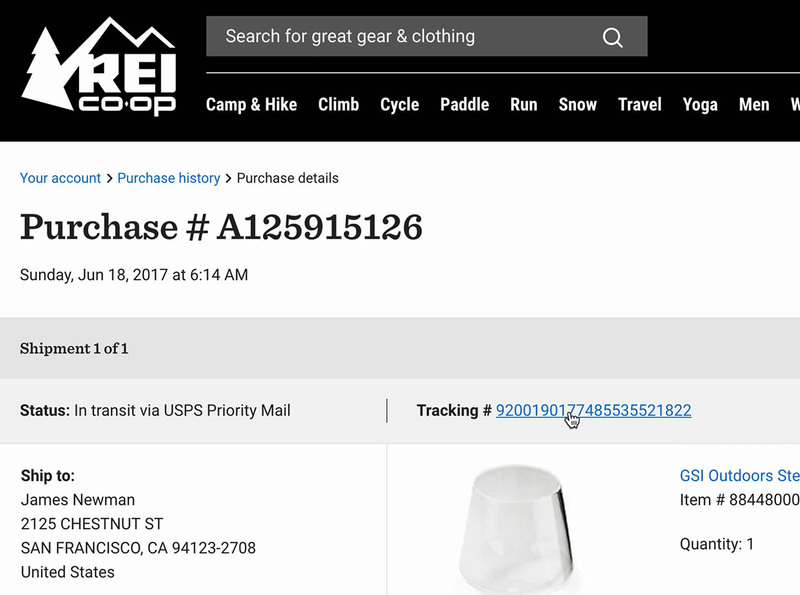 This user found it difficult to get back to REI after clicking a third-party tracking link, one of a number of users during testing who had difficulty with the transition between e-commerce sites and third-party tracking sites. 3) An incoherent user experience. It has been our observation over multiple years of usability testing that some users, especially more novice users, are generally uncomfortable with being taken to a completely new website after clicking a link on an e-commerce site. On the new site users have to reorient themselves and figure out why they’re there, why they were sent to the new site, and how to navigate through it. Furthermore, any web switch sometimes causes technical or practical issues (especially on mobile devices). While such issues can also occur on the e-commerce site itself, users there will have the benefit of inline help options, such as live chat or phone numbers to customer support, or can simply go back to their account dashboard or orders overview. While technical and usability issues on the third-party site are not the fault of the e-commerce site, they will still actively detract from users’ overall order experience. Furthermore, some users won’t give the e-commerce site the benefit of the doubt (“It’s not REI’s fault”) but will instead blame the e-commerce site for the poor experience, rather than only blame the third-party courier. While some of the above issues can be partly addressed, most are inherent limitations of splitting the order-tracking experience onto two different platforms, served by two different companies. On HP users can see a detailed list of the subevents of the delivery, the estimated delivery date, and courier name. Especially note how the visual progress bar helps establish the overall order flow and how far the order has progressed, as it includes all the different order subevents (not just package-tracking events). 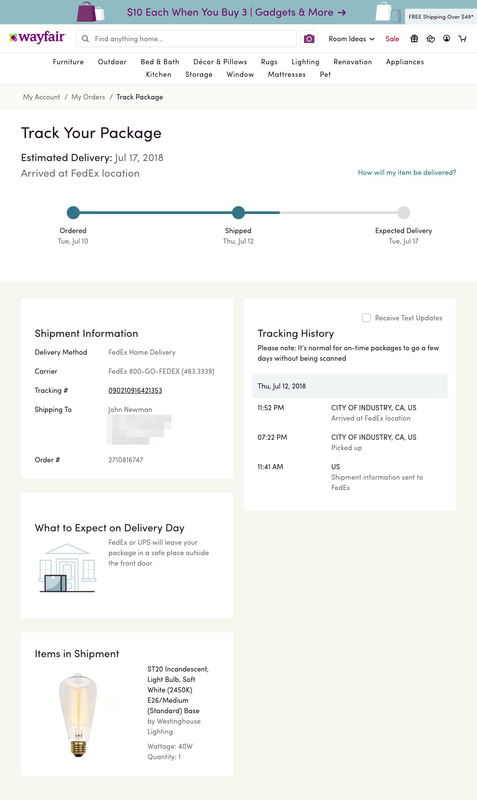 For a better order-tracking experience, sites can provide all the tracking details that users would need, such as delivery date, courier name, and shipment subevents, on their own order-tracking page. Providing order-tracking information within the e-commerce site itself was observed in testing to greatly reduce users’ need to go to a third-party site, thereby alleviating all of the observed usability issues outlined earlier. At Wayfair, tracking information is integrated in the site, allowing users to get the tracking information they need, as well as additional delivery details (e.g., “What to Expect on Delivery Day” — especially useful when receiving large or oversize items such as furniture) and general order information. By integrating order-tracking information and events within the e-commerce site, sites control the end user experience. 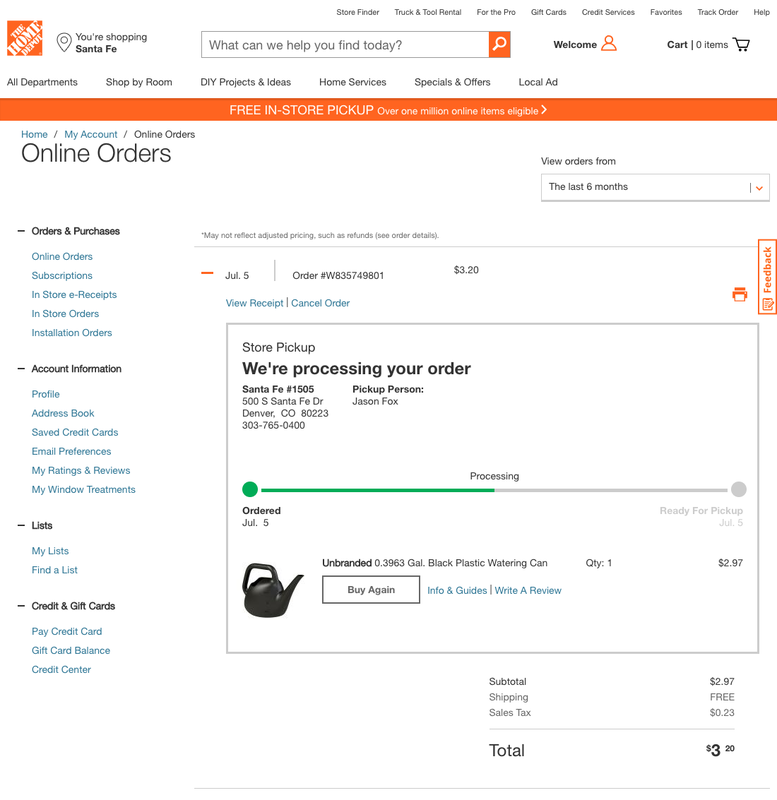 This allows Home Depot to display the current order status, as well as provide additional useful information, such as the order total, manuals and guides, and a link to review the product, all within the same interface. Showing all key elements of tracking information requires an investment in technology, but there are clear benefits to users, in addition to a potential reduction in customer service interactions caused by difficulties with and confusion about third-party sites. Both the layout and the terminology on third-party tracking sites is out of the e-commerce site’s control, so any UX issues here will essentially be the e-commerce site’s UX issues, but without any option for the user to resolve it. 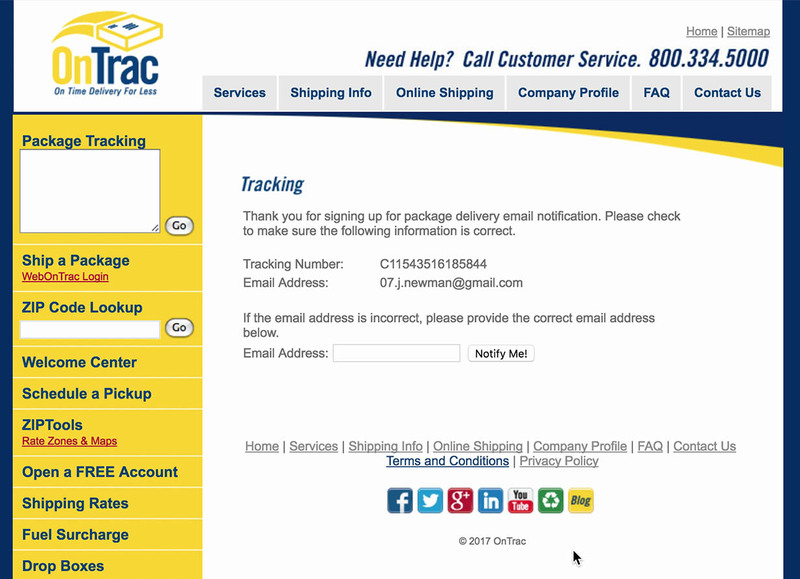 For example, the interface for OnTrac (first image) was found in testing to be unclear, with the delivery date being difficult to see. One reason was the use of the industry jargon like “Service Commitment Time” (instead of the more normal “Delivery/Arrival Date”). 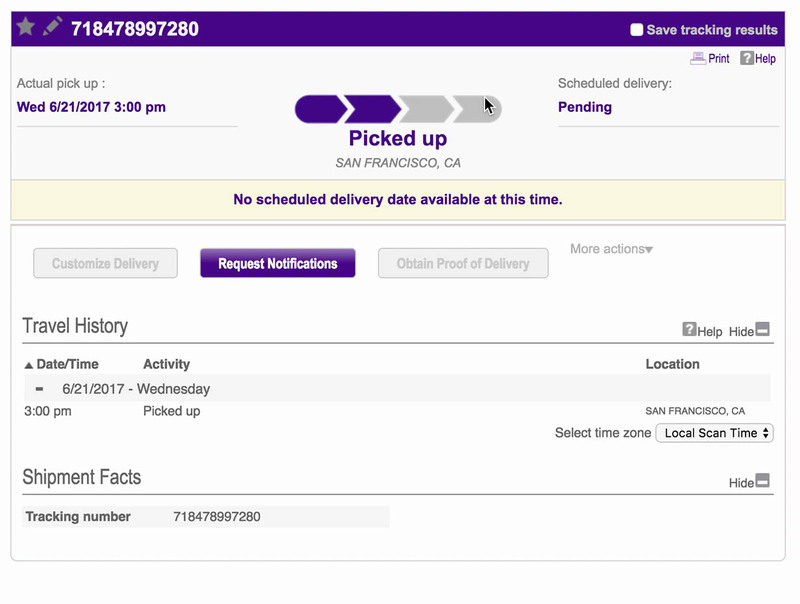 On FedEx (second image), another test subject said, “‘Picked Up’ vs ‘Pending’…It says it is picked up? It says it’s pending? I am really confused”. Sending all users to a third-party tracking interface, just to perform basic order tracking on such things as the arrival date or shipment subevents, causes an e-commerce site to lose control of the end users’ order experience. As observed in testing, third-party shipping sites sometimes have interface designs or terminology that are highly influenced by “shipping industry” practices. Shipping courier sites tend to use their own industry terms and don’t necessarily have the same business interest in investing in an interface that’s highly optimized and provides a fully user-centric experience. Hence, integrating the full order-tracking details into the e-commerce site is the only way to remain fully in control of the order experience and prevent unresolvable UX issues introduced by shipping courier sites, and prevent the friction caused by forcing all users to navigate from the e-commerce site to a third-party site. Yet 56% of sites don’t integrate all tracking information and events within the site itself but instead rely partially or fully on third-party package-tracking sites. This article presents the research findings from just 1 of the 640+ UX guidelines in Baymard Premium — get full access to learn how to create a “State of the Art” Accounts & Self-Service user experience. Authored by Edward Scott. Published on April 2, 2019.